Shortly before H. W. Fowler’s renowned Dictionary of Modern English Usage appeared, almost a century ago, excerpts from it were published in the tracts of the Society for Pure English (Fowler was a member) and subject to critical commentary. One entry proved especially contentious, sparking a lively exchange with linguist Otto Jespersen. These two grammatical heavyweights disagreed over what Fowler called the fused participle (aka possessive with gerund, or genitive before a gerund): a phrase like it led to us deciding, instead of the possessive form that Fowler would insist on: it led to our deciding. When Fowler scorned the construction as ‘grammatically indefensible’, Jespersen (also in the tracts) defended it on historical principles and called Fowler’s piece ‘a typical specimen of the method of what I call the instinctive grammatical moralizer’. 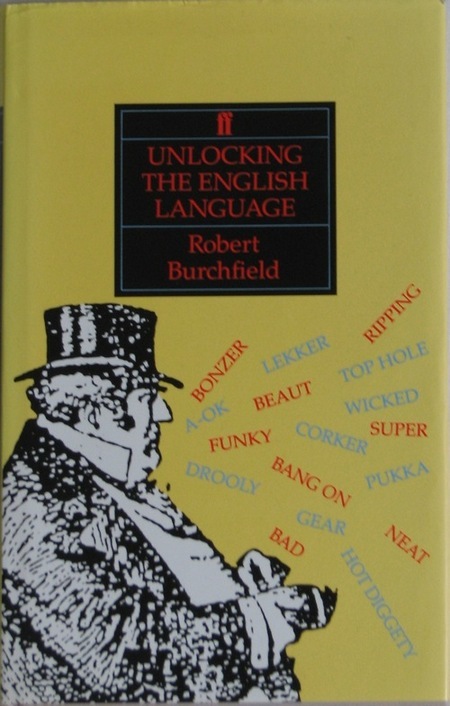 Unlocking the English Language by Robert Burchfield (Faber & Faber, 1989) had been sitting unread on my shelf for far too long, so I let it jump the queue and am very glad that I did. For readers interested in lexicography and word lore it’s a goldmine, with fascinating facts, anecdotes and esoterica on every page. Burchfield was a New Zealand-born philologist who spent much of his life working as a lexicographer in England. From 1957–86 he edited the new four-volume Supplement to the OED, and later wrote an admirable third edition of Fowler, among other works. He championed inclusivity when it came to taboo words and global varieties of English. So there’s a rule in English, except it’s not a rule, but some people think it is, and others who know it’s not a rule obey it in case it bothers the people who think it is, even though it can cloud or change the meaning of their prose. Ah, split infinitives: what an unholy mess. A split infinitive is where an element, normally an adverb or adverbial phrase, is placed between to and the plain form of a verb – to boldly go is a well-known example. The construction is six or seven hundred years old; there’s nothing grammatically wrong with it, and there never has been. Usually it’s not even a stylistic lapse. Before we continue, I should point out that split infinitive is a misnomer, since English doesn’t really have them. But it’s a convenient and familiar term, so I’ll use it. Nice is often held up as an example of semantic drift: its meaning has changed often, and radically, since it entered English in the 13thC from Old French nice “simple, silly, foolish”, from Latin nescius “ignorant”. Agreeable, pleasant, satisfactory, delightful, generally commendable; (of food) tasty, appetizing; (of a person) kind, considerate, friendly; iron. (very) bad, unsatisfactory. colloq. This usage has long been criticised for being vague, overused, and colloquial. Partridge, in Usage and Abusage, called it “an indication of laziness”, while Fowler blamed the word’s own good fortune, and women, for ruining it: “the ladies”, he wrote, had “charmed out of it all its individuality & converted it into a mere diffuser of vague & mild agreeableness.” Woe is mankind! Nowadays, nice is used mostly in speech and fiction, as the following at-a-glance genre graph from COCA (1990–2011) shows. You can click through for examples in each category. Comparatively few instances of the word are found in academic texts, and many of these are acronymic or dialogue uses. The passage plays astutely on the word’s polysemy, while the reference to Johnson is, well, a nice coincidence. Today I saw a page of Isaac Watts’s Logick which Johnson had marked up to quote in his Dictionary: “Nor have we either Senſes or Inſtruments ſufficiently nice and accurate to find them out.” The word nice, exemplifying one of the usages of which Fowler later approved, was duly underlined.